In this image, we see Death, represented by a skeleton, trying to extinguish the candle of life. On the opposite side of the candle is Father Time, hourglass in hand, attempting to prevent Death from putting out the candle. 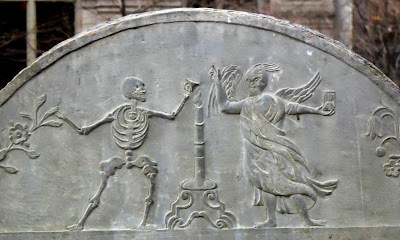 From the gravestone of Rebecca Gerrish, located at King’s Chapel Burying Ground in Boston. In the Western world there’s a continuing tradition of making resolutions at the turn of each year. In a sense, people want to commit to resolutions that’ll help them become ‘better’. We can see two aspects to this attractive custom: 1) the intention and the opportunity for people to keep their resolutions; and 2) the content of the resolutions and commitments. Both of these factors are of great importance. If you can’t keep to what you’ve promised yourself, then setting even the most noble ideal as a goal is pointless. And if the resolution’s something that, in the end, doesn’t make you any better, then committing to it might actually work against you rather than for you. But there’s also another factor: time. We’re under pressure from time. Our resolutions have to be kept within time. And people today are less willing than ever to allow time for the attainment of their goals, for keeping the promises they’ve made to themselves. For Christians, the basic purpose and aims in life are to be found in the Gospel commandments. We might say that the aims are the cultivation of the virtues and the mortification of sin. The fundamental purpose, however, is to imitate Christ and achieve perfection, glorification. We encounter many difficulties in our life, however, which prevent us from observing the commandments and reaching our final goal. These difficulties spring from either the external environment or from ourselves as people. Even Christ’s disciples and others who actually heard Him preach and experienced His example at close range were often disheartened. They’d say to Him: "Your words are hard, Lord. How can we observe them?" They understood that our nature’s weak and tends towards evil and sin. We give ourselves aims and ideals, we want to improve ourselves and society, but we keep failing. Christ’s answer was simple, but very profound: "What’s impossible for people is possible for God." It’s as though He’s saying, in different words: "It’s not possible that God would create you and become human for your sake and would then set you difficult aims and just leave you on you own to achieve them without any help. God’s with you all the time. In your weakness, your failure and your sin. Just say, 'Lord have mercy. Help me, God. I’ve sinned, Lord.' And He answers, 'Leave all that to Me. Your great purpose in life, your salvation and glorification aren’t yours to achieve, but are My gift to you.'" But what about the variable of time. What should be the attitude of Christians towards it and how are we to deal with it? At this point, let’s hear the words of a modern ascetic, someone who speaks the language of our own age: Elder Aimilianos of the Holy Monastery of Simonopetra, on the Holy Mountain of Athos. "We’re all aware of how quickly the years pass and how quickly what we thought we had becomes the past…So people who think they hold life in their hands and can deal with it as they wish come into conflict with the reality of this transient life and the vanity of the things of this world. It’s foolishness and a great delusion for people not to think about the “fewness of the days”, for them not to have a sense of the transience of the present and not to experience the flow of time, which so swiftly brings us to the end. Time is our constant companion. You’d think it was putting pressure on the sun to rise more quickly and to set faster. And when we aren’t aware of its breath and are distracted by other, worldly noises, we then come to the tragic conclusion that the hours, days, months and years are passing at great speed and that suddenly we’ve reached the end, without realizing it. I don’t want to plunge you into melancholy with these thoughts. I want to help you to share the feeling of the passage of time and to make an effort to use it for your progress, happiness and sanctification. At the beginning of the New Year, we make spiritual plans. Sanctify your time, in order to make the year a happy one. Don’t waste it on worthless things that don’t leave you with a taste of joy. Listen to the words of Paul, who ascended into heaven, 'making the most of the time, for the days are evil' (Eph. 5:16). This means using time for works of love, spiritual advancement, life in the Church, sanctification and repentance. … For those who’ve wasted their time and haven’t used it reasonably and spiritually, the hour comes when they curse themselves and disconsolately accept the waste of their lives as a defeat." This is my message to you at this New Year. Within the joy of the traditional feast, dominated as it is by the saintly figure of Basil the Great, lay the foundations for a new spiritual structure in your soul. Make good resolutions for greater efforts, greater diligence, greater love and greater human kindness. May the New Year bring new life to the whole world; may it extinguish the fires of the passions and of hatred; may it cool the thirsting souls with the breeze of love; and may it bring peace and happiness to all of you. The New Year will be happy if we also contribute to it; if we make a proper effort, then the blessing of God will certainly also be with us. Aimilianos Simonopetritis, Περί Θεού: Λόγος Αισθήσεως, Holy Convent of the Annunciation of the Mother of God, Ormylia, Halkidiki, published by Indiktos, Athens 2004.